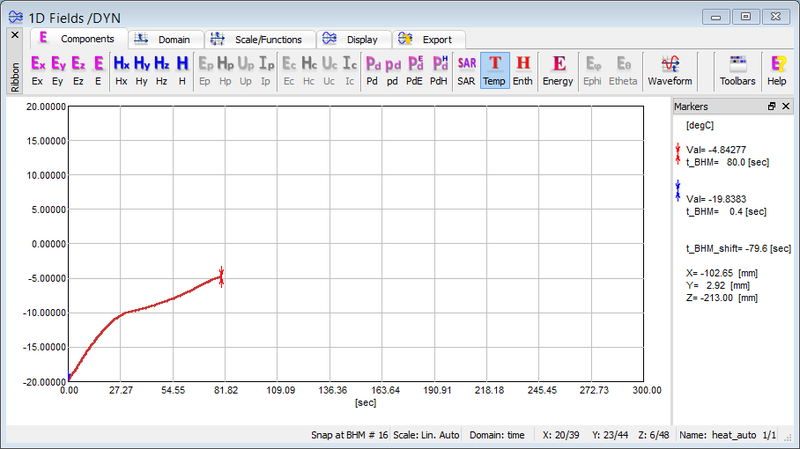 The monitoring of electromagnetic quantities is available in 1D Fields window. The displays show the instantaneous amplitude values of chosen electromagnetic quantity but the envelope lines (time-maxima) can be also enabled. When domain is space, we usually want to construct the envelope (time-maxima) of the field at each considered point in space. However, when domain is time, usually only the time-history is of interest, and the external envelope lines do not provide any useful information. 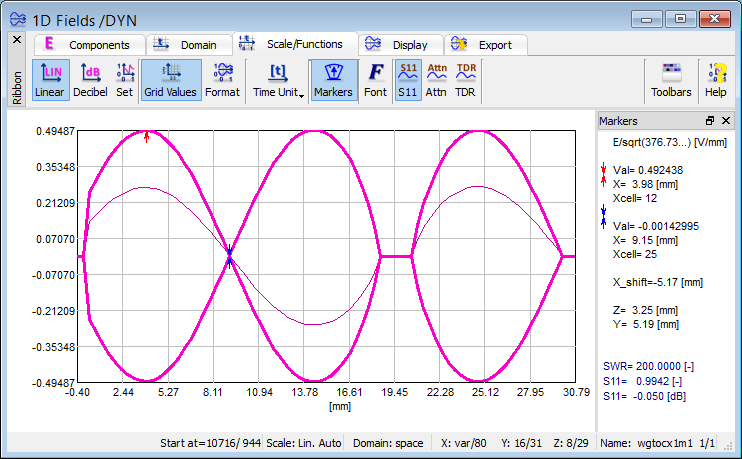 Space Domain option allows monitoring the instantaneous and time-maxima values of electromagnetic quantities along any line in the circuit, parallel to one of the coordinate axes. 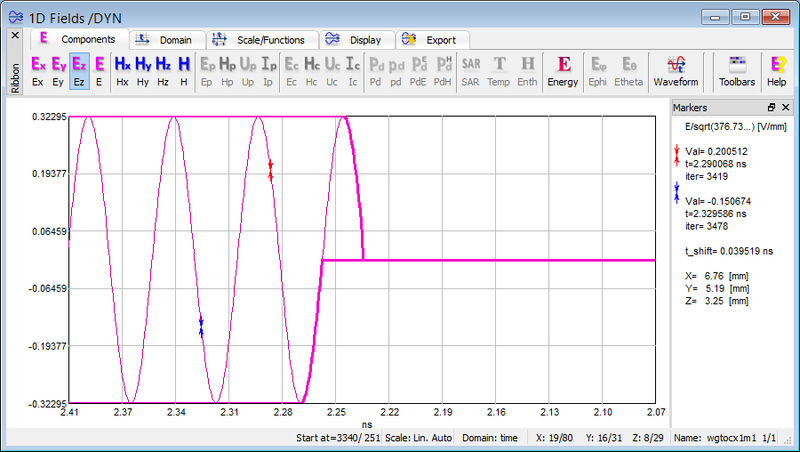 For example, if X-axis is selected, we further specify Y-coordinate and Z-coordinate of the line under investigation. These coordinates are introduced in FDTD cells, but their absolute position (in millimetres) is displayed in the Markers frame of 1D Fields window. If the envelope lines are on, they stand for time-maxima of the field�s value at each considered point in space. Time Domain enables watching the variation of the selected quantity versus time at a particular point of the circuit. 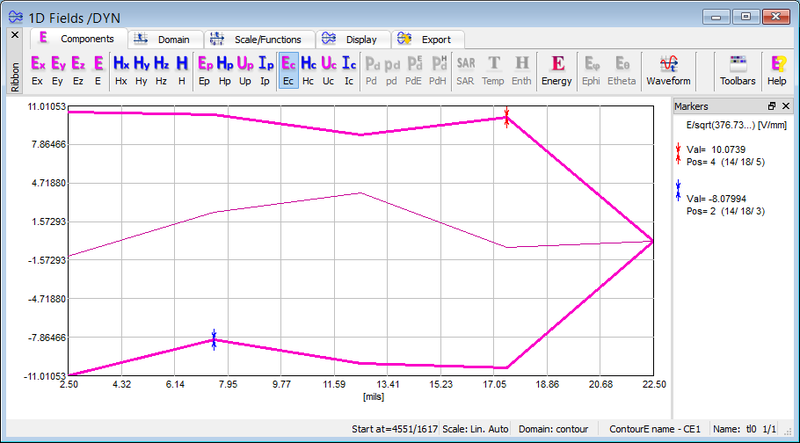 The observation point is defined by its X-, Y- and Z-coordinate given in the FDTD cells, in 1D Fields window. It is possible to determine how many time samples will be displayed in the window showing the simulation results and many other advanced options in Position & Parameters dialogue. Thermal components available in QW-BHM regime, temperature and enthalpy, are displayed versus the heating time, and not versus the electromagnetic (FDTD) time like the electromagnetic components. See also online documentation about monitoring along specified line and versus time.